While all our Heathrow Airport Hotels are within a few miles of the airport, we also offer two hotels connected to the Heathrow terminals. Book one of these and forget the middle-of-the-night dash to the airport and the transfer bus to the terminal. Just spring out of bed and stroll to the check-in desk. Please note: The hotels above are listed according to the terminal to which they are closest. They do however, have transfers available if you are flying from an alternative terminal. This sophisticated, ultra-modern hotel has a beauty salon, three restaurants, a bar and even a British Airways check-in desk. All rooms have a minibar, soundproofing, blackout curtains, a full-length mirror and reading lights. There's even a golf cart you can hire to transport those bulky bags. The Hilton is especially great if youre looking for hotels connected to Heathrow terminal 4 with it taking just a 5 minute walk to check-in. Another bonus is that The Hilton is one of our Heathrow airport hotels with parking so you don't have to worry about organising airport parking separately. 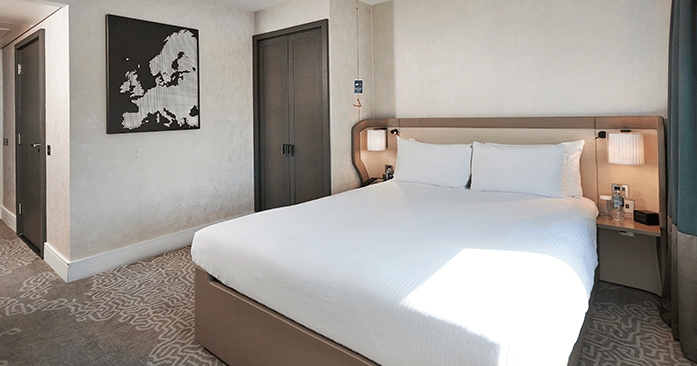 If you're looking for hotels connected to Heathrow terminal 5 the luxurious Sofitel is the perfect choice for you. From the hotel you can walk to the check-in desks at T5 via the covered walkway in just 5 minutes. Start your trip in style and enjoy a range of 5-star facilities including a choice of restaurants, bars, a tearoom, spa and relaxation room, and 24 hour gym to name a few. In your room, you'll get a queen-size MyBed, a minibar, a flatscreen cable and satellite TV and luxury toiletries. This brilliant Heathrow terminal 5 hotel also has the option to add parking to help make your airport experience even more hassle-free. Why book a hotel connected to Heathrow airport? This list is for those of you who may need a little more persuading as to why a hotel so close to Heathrow would benefit you. Renaissance - To terminal 2 it's a 7 minute shuttle on the Heathrow Hoppa and to terminal 3 it's a 9 minute shuttle ride. Park Inn - It takes 13 minutes to reach both terminals on the Heathrow Hoppa. We've a wide range of hotel upgrades which you can add to your booking at the Hilton or the Sofitel. After you click the book button, a list of upgrades will come up for you to choose from. At the Hilton you can upgrade to an executive room, with access to the top-floor executive lounge. At the Sofitel you can book yourself an English breakfast for less than you'd pay at the hotel, a spa treatment or a massage, or upgrade to a better room or family-sized junior suite. At both hotels you can book yourself into one of our Heathrow airport lounges, get traffic updates by text on the day you travel, and sort out your holiday currency and holiday insurance.